Bates alumni arriving for their College’s 138th Reunion anticipated traditional revelry and fellowship as well as a chance to honor their own. Weekend awards granted by the College’s Alumni Association will recognize service to Bates and to the world, including honors for a former president of the American Medical Association and a retired U.S. diplomat who helped draw worldwide attention to acts of genocide in Sudan in 2004. Receiving the Benjamin E. Mays Medal for “distinguished service to the larger worldwide community” and “outstanding accomplishment” will be Constance Berry Newman ’56. 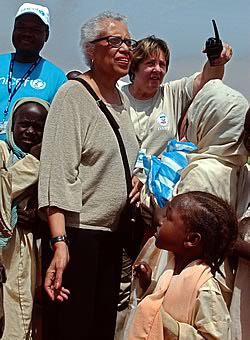 As U.S. Assistant Secretary of State for African Affairs in 2004, she and others determined that violence in Sudan’s Darfur region was indeed genocide, so advising then-Secretary of State Colin Powell. In September 2004, Powell for the first time announced those findings to the Senate Foreign Relations Committee. Dr. Robert E. McAfee ’56, of Portland (right), will receive the Alumni Community Service Award. In 1993, McAfee was the first physician from Maine elected as president of the American Medical Association. His influence is credited with having the AMA consider family violence a medical rather than a social issue, urging the AMA to mount an educational campaign for families and physicians about family violence. During his career as a vascular surgeon he has been outspoken in efforts to prevent smoking and substance abuse and to improve the health of adolescents. All awards will be presented Saturday during the midday Alumni Awards Ceremony, held in Merrill Gymnasium due to rain. Longtime Bates trustee Barry A.G. Greenfield ’56 (left) will receive one of two Helen A. Papaioanou Distinguished Service Awards. A member and chair of the trustees’ Investment Committee for 10 years, Greenfield, now retired from the board, is credited with bringing professional management standards to the investment of the College endowment, including developing a subcommittee structure to oversee various investments and hire fund managers. Lynn W. Willsey ’54 and Beverly Hayne Willsey ’55 (right) will also receive a Papaioanou Distinguished Service Award for their long, loyal and talented service to the College. 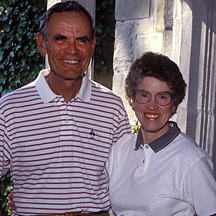 Lynn, a trustee from 1972 to 2003, served as secretary of the corporation and on committees including Admissions and Financial Aid, Co-curricular Life, Student Affairs and Investment, as well as the Executive Committee. Beverly has volunteered as an officer of the Hartford Bates Club, a class officer, a member of her class’s Reunion committees several times and chair of her class’s 50th Reunion in 2005, an Alumni in Admissions volunteer and a host for mini-reunions and Bates dinners. She currently volunteers as a member of the Bates College Key, to which she was elected in 1973, and with the Office of Career Services as a career adviser. Receiving the College’s Sesquicentennial Prize, for extraordinary achievement in the fields of literature or science, is Charles E. Clark ’51 (left), professor emeritus of history at the University of New Hampshire. Author of The Public Prints: The Newspaper in Anglo-American Culture, 1665 – 1740 (1994), Maine: A Bicentennial History (1977, 1990), The Eastern Frontier: The Settlement of Northern New England, 1610 – 1763 (1970, 1983) and The Meetinghouse Tragedy: An Episode in the Life of a New England Town (1998), Clark was tapped to produce a Bates history for the College’s sesquicentennial celebrations in 2005. His Bates Through the Years: An Illustrated History traces Bates history while mirroring larger issues — including important educational and social debates — of the last 150 years of American history.